1) 18” Jet Bandsaw—used to resaw lumber, rip rough-cut boards, cut small pieces, make angled and scroll cuts, cut tenons, and shape plane blanks. 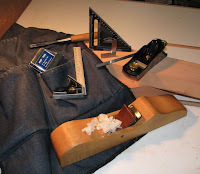 2) Lee Valley Veritas Low Angle Block Plane—for chamfering edges, trimming dovetail and finger joints, planing small boards on edges and face, and making dowels. 3) Krenov-Style Jack Plane—of all the planes I’ve made, this one, my first one (beginner’s luck), still works best, even on end grain. It cuts a very fine shaving, so I use it for final finishing and jointing. 4) 5/8” Japanese Chisel—a good size for most projects and keeps a sharp edge for a long time. a. Bridge City Toolworks 4” Square—accurate and pretty and the only item from this company that I can afford. b. 1.5” Engineer’s Square—just the right size for small pieces and for transferring layout lines to edges. Great for dovetails. c. 6” Ruler with 1/64” increments—I have two because I’m terrified of losing it. e. Tape Measure—for measuring long boards. I absolutely cannot get used to a folding rule.